Fresh pulp of hibiscus flower and leaf reduces hair fall while neem leaf extract and rosemary oil control dandruff. Jasmine essential oil imparts beautiful aroma to the hair. Apply on wet hair and massage thoroughly. Wash.
Handcrafted with fresh herbs, cruelty free, palm oil free, paraben free, alcohol free. Regular use of this shampoo nourishes the hair. 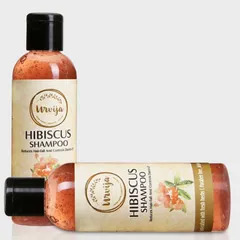 The fresh pulp of hibiscus flower and leaf reduces hair fall while neem leaf extract and rosemary oil control dandruff. Jasmine essential oil imparts beautiful aroma to the hair.